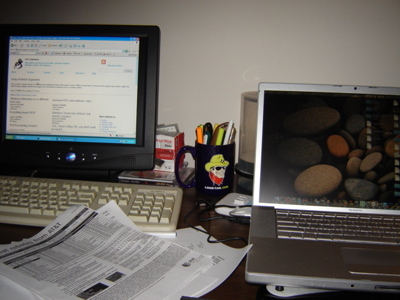 You might think the picture below is showing a Windows PC sitting beside my Mac. Actually it's not: that other monitor is attached to the Mac and that's Parallels running Windows XP on the screen. If you've never used dual monitors, you may not immediately see the advantages - after all, you can quickly Apple-TAB to any application or use Spaces to switch screens entirely. The dual monitor does offer more screen real estate, but is that really all that useful? Yes, it is. Even Microsoft says so, and we know they are always right. No, really: it is useful. And it's even more useful on a Mac, though before I leave PC's out entirely, let me mention this interesting use of dual monitors. That uses a VNC product and Mac dual displays to bring up a PC screen on the extra monitor. That's conceptually similar to what I do for remote support: when I'm using VNC, Remote Desktop or even GoToMeeting or similar tools, putting that support session into the other monitor is very useful. So how do you set up dual monitors on your Mac? Pretty simple: plug it in. On my MacBook Pro I have to use an adapter (make sure you bring that adapter when you take your Mac out for a ride: you never know when you'll need or want it) but it's really that easy.. well, not quite. First, I'd suggest NOT having Parallels running when you hook up the second monitor. It's not going to break anything, but it can confuse things a bit, and this experience can be confusing enough at first anyway. I'd also recommend disabling Spaces if you have it enabled; again, there's nothing wrong with Spaces, and it works perfectly with dual monitors - I love Spaces with dual monitors! - but it can be more confusing at first. Baby steps first, and once you feel comfy, you can turn Spaces back on. 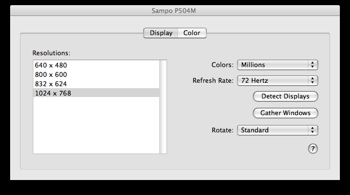 You'll want to open Displays in Preferences and tell it to "Detect Displays". Unless there's something very strange about your monitor, that's all you need to do: a desktop and a Display Preferences window should pop up on the new monitor. If it does not, click "Gather Windows" to bring that Preference dialog back onto your main screen - it will probably be slightly behind your main monitor's preferences, but it should be there. Adjust resolution, colors and Refresh Rate if necessary. You'll notice a "Rotate" button also - I'd stay away from that just now too unless you have put your monitor on its side or upside down. Back on your main display's Preferences you'll see "Arrangement". It makes sense to arrange the screens to match their physical location. Your Mac doesn't know where the cable goes, so you need to drag the screens so that they make sense - because it is moving your mouse off your main screen that lets the cursor get to the second monitor. If the Mac thinks the other screen is to the right, you need to move the mouse to the right.. and just keep going at the edge of the screen and your cursor suddenly will appear on the other monitor. Neat, right? But where is the menu bar? Hey, somebody forgot something, because the Dock and the Menu Bar stayed on the main screen! Yes, that is the way it works, and at first I thought that was really annoying, but it only took me a few minutes to get used to that and now it just seems natural. If you feel comfortable, turn Spaces back on (and start up Parallels too). Spaces is really neat with dual monitors because the new monitor space is just part of the Spaces real estate: so when you switch to a different Space, your other monitor switches to whatever it displays in that Space. Confused? Play with it and you'll see what I mean. If your monitors don't use the same resolution you will find that Spaces will annoyingly resize things - I don't know any way around that other than matching resolutions. But even at that, dual monitors are still great to have. One more thing to watch out for: if you've left something in the other monitor and disconnected it, it can be impossible to get to that app's window until you click "Detect Displays" again. That's all you need to do: everything will return to the main display immediately. I use 22" acer monitor connected to my MBP with MacOS X Leopard to show cartoons to my daughter while working. And I noticed a strange way MacOS X acts with two monitors. If I close my MBP with another monitor still connected and then move or cleck my mouse, which I use with my MBP - all the stuff that has been being displayed on the screen of the MBP moves to Acer monitor (including Dock and top Menu bar). But when I open my MBP again, there is no way to wake up its display but disconnect external monitor. Is there any way to fix that problem? What you are describing is the established process for how you initiate using just the monitor w/o activating the laptops screen. Having an extermal monitor and key board attahced to a sleeping mac will wake it up and just activate the monitor. You'll need to unplug the monitor and keyboard to get the laptop screen to reactivate. You don't need to put it to sleep again to do that. Btw, I haven't yet checked out if the situation remains the same in Mac OS X 10.5.3 (the last update), they might have fixed it already. to come back to work on the main screen you don't need to unconnect the external monitor, just use detect monitor while MBP lid is open. It should switch immediately. Do you know how to get the dock and menu bar to switch to the secondary monitor whenever it is connected? Since my secondary display is bigger/nicer, I work mostly from it and would like the dock and menu bar to be there. I had this set up on my MBP at work, but I no longer work there and can't ask the support guy how he did it. Isn't it just In your Displays pref, drag the menu bar to the external monitor?? Ummm. No! There is no need to unplug the external monitor to get back to a "normal display" (i.e. the MBP screen live as well as the external monitor). Simply leave the MBP lid up (or open the MBP so the lid is open -- i.e. screen visible). THEN go to the login window (on the external monitor) and put the MBP to sleep. Then wake it up again, and voila, both screens are active. I'm running a second monitor with a Hanns-G HW191D. It works great - sometimes. Other times it's not so great. My monitor is on, connected perfectly to my comp and all the display settings are set up the way they should be (or so I think) and my 2nd monitor with pull up nicely but only for about half a second then it goes black. I can still move my mouse and other windows to the 2nd screen (though I can't see them when they're over there. But sometimes it works great. I'll leave the monitor unplugged for a day or so and will have restarted my comp and it works fine. I don't get it. Anyone have any ideas? My first guess would be loose/defective cable. Any tips on using a VNC client on my Mac to remote into a Windows PC and be able to use dual PC display (i.e. extend VNC desktop to both displays)? I want to Thank You for this. It is still valuable today and it helped me see clearer. I recently unplugged my monitor, and used the detect displays to bring my working documents back to the laptop, but when I try to open them, they remain off screen. I've also had the same problem and detect displays does not resolve this. If I use Expos�, I can see the application running off screen but I cannot get it back to my main screen unless I hook it up to the second monitor and drag it over which defeats the purpose of having a mobile laptop. Help or suggestions? my screen broke on my macbook so i plugged into a moniter and now i cant get it off dual scree. what should i do? You didn't read this article, did you? Read the last paragraph before the comments. i have a 32in. samsung tv and am using it as a dual screen with my mac, it works great except that on the tv it is zoomed in a little bit, kind of annoying cause i cant see the toolbar. i tried different resolutions but its not helping, also the control+scroll doesnt work. anyone know how to fix it? Does this whole set up work with a mac book? I don't see all those connector ports and stuff. Also, I would like to know, could I set it up so that my PC desktop is the 'dominant computer'. If you have a recent Macook, you have the Mini DisplayPort (link) and yes, you can get an adaptor for that. I have used dual monitors for over a year. This is a function that enables viewing multiple spreadsheets or other programs simultaneously. As you get skilled at it you will find that you do not have to constantly switch between one view and another (minimize/maximize/restore down). Your utility and productivity can increase exponentially. For presentations where there is no projector available there will almost always be a second monitor available. You can select "Mirror Screens" so that your presentation displays on both screens simultaneously. Simply turn the second display monitor to your audience so they can view it and away you go. I have dual monitors on my Mac, but unlike my previous experience with my PC dual monitors, I can't view more than one program at a time. When I bring Firefox up, for example, Word or Excel disappear, and vice versa. My objective was to be able to view web pages with Word or Excel open to transfer data from the web to my own spreadsheets or Word doc. Am I out of luck with the Mac or is there something I'm just plain missing? Help! Is there a keyboard shortcut that will swap the images on the 2 monitors? So can spaces send an "unfocused" space to a projector, say for outputting a video window, while the controls are set in real time in the active space window (set just for native computer screen)? No different than any display. See (link) by the way..
Good to hear. Thank you for the quick reply. I have one more question that may or may not be relevant to this topic: Can a portion of the screen be output to a monitor or projector instead of full screen? I think some computers have this function but I can't find anything supporting this for OSX. You could put an app in Spaces.. but that may not be what you mean. No, let me see if I can explain it better. I'm using a program that generates an output video window which unfortunately has no video out options. So in a perfect scenario I would have the controls be in space 1 (active on computer), the video window in space 2 (sent out to projector) with some kind of software (screen capture of some kind) that is somehow able to draw a box around that video window to output to the projector/tv etc. Full screen could work but the menu bar of the window for this program cannot be disabled (I don't think) so the "immersion" might be disrupted by that. Sounds like a great idea, but I'm not aware of anything that could do that. You might be able to fake it with just mirroring the display and making the projector dimensions only large enough to fit the output, but that seems clumsy at best. Let us know if you ever do find an app to do that. just click Command + F1.. And you'll have both screen mirrored.. Thanks for the interesting post. This is what I want to do: I want to have one of my spaces mirrored on an external display (a projector), so that when I switch spaces on my laptop, the screen slides from space to space as normal on the laptop screen, but the picture on the projector stays the same. To be specific, I want to present to my class one application. But I want to copy and paste input into that application from another application that I do not want my students to see. I will switch spaces back and forth on my laptop, but the projector will only show the space with the first application. This sounds almost like the regular dual-monitor situation, except that I want to switch (on my laptop screen) to and from what the projector is displaying, leaving the projector display alone. I don't think I can just do this like dual displays, because I don't want to have to crane my neck around to try to track the mouse on the projector screen. Is something like this possible? A projector is just another monitor as far as your computer knows. Anything I can think of that you can do with two monitors should be able to be done with a monitor and a projector. mac book connected to my 22" samsung monitor - I have to move my image on my notebook all the way to the right , then it will appear on my external monitor - I will / checking mirror fix it? so my image on my notebook will be the same on my external? And exactly why wouldn't you just TRY it to see for yourself??? ?